Are you thinking about taking a look at other employment options? If so, you’re not alone. 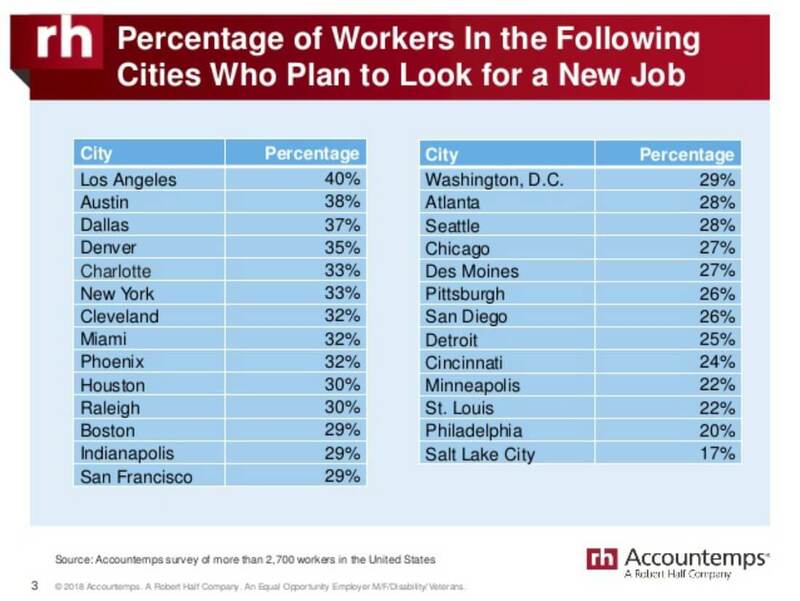 A recent survey conducted by staffing firm Accountemps looked at more than 2,700 workers across 27 major U.S. cities. What they found was nearly three out of every ten respondents said they plan to look for a new job in the next 12 months. RewardExpert spoke with Michael Steinitz, executive director of Accountemps about the survey results and his tips for landing your next position. While Accountemps did not conduct the same survey in 2016, and therefor could not speak directly to any change in the number of workers planning to look for new jobs, Steinitz pointed to historical government data that shows the survey results are the continuation of an upward trend. Steinitz said when employees are confident with where they—and the country in general—are headed economically, they are more comfortable seeking opportunities that may be a better fit for their career aspirations. The survey also found that the percentage of workers planning to look for new jobs this year was particularly high in a number of specific geographic areas including Los Angeles (40 percent), Austin (38 percent), Dallas (37 percent), and Denver (35 percent). Steinitz speculated that these cities have higher percentages of potential job changers for a number of reasons, including market growth in the area, generational diversity, and low unemployment. If you’re ready to look for a new job, it pays to prepare yourself first. Find resources you can count on. Knowledge is power, and the blog of Accountemps’ parent company, Robert Half, is an excellent resource for information on resumes and cover letters, common interview questions, post-interview follow-up, salary negotiation, and much more. You’ll also find salary guides for professionals in finance and accounting, technology, legal, office and administration, and creative and marketing. Each salary guide includes information on in-demand positions and skills as well as salary comparison analysis by city. Review this article on the Robert Half blog about writing a good resume to get started. Proper resume length is something many job seekers find confounding, and the Accountemps survey, which also polled more than 300 senior managers and 300 HR managers, found them split nearly 50/50 on their preferred resume length. 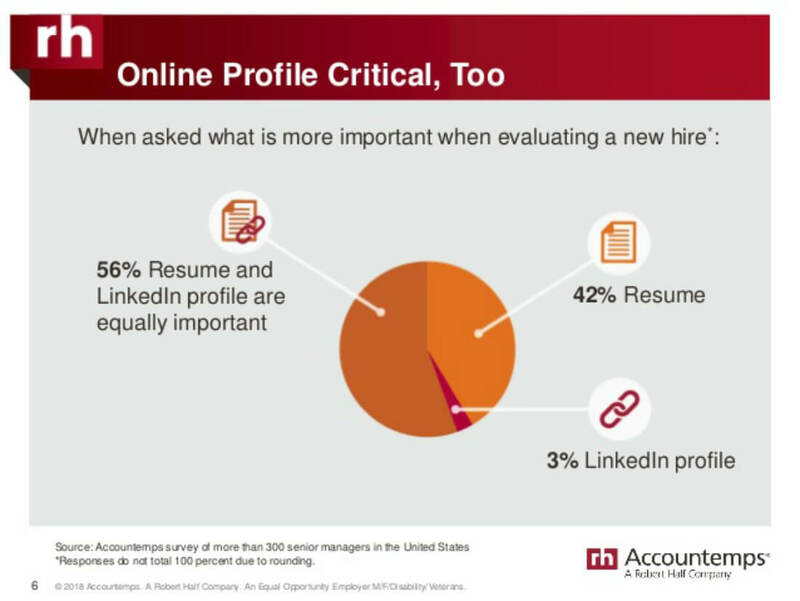 More than 50 percent of the managers surveyed by Accountemps said that a candidate’s LinkedIn profile is just as important as his or her resume. This isn’t surprising, given the way social media has permeated nearly every aspect of our daily life. Steinitz suggests taking a look at all of your social media accounts—including LinkedIn—before you apply for a job. He also suggested making sure the privacy settings on more personal social media accounts—typically Facebook, Twitter, and the like—are maximized. “We also recommend that people periodically Google their name to make sure there’s nothing surprising out there,” Steinitz added. To learn more about Accountemps or to view the survey, visit their website at www.roberthalf.com/accountemps.